Sectigo (formerly Comodo CA) is a leading brand in online security and the world’s largest provider of business-validated SSL Certificates. Sectigo SSL products secure and authenticate online communications for over 200,000 business customers worldwide and protects more than 25,000,000 global users of its award-winning desktop security solutions. E-commerce merchants are going beyond the gold padlock to go green with Extended Validation SSL Certificates, the e-commerce standard for trust and security. The EV SSL certificate was designed to strengthen e-commerce security and combat phishing attacks to make EV SSL the most complete SSL certificate available. 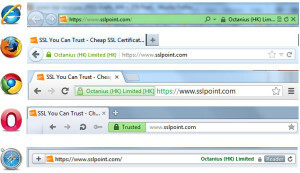 European customers trust the green address bar and will notice instaktly that your web site takes security seriously.